The father of seven has been a dedicated member of the Brooklyn College staff for more than 20 years. Officer Hubert Evans sharing his degree with President Karen L. Gould. 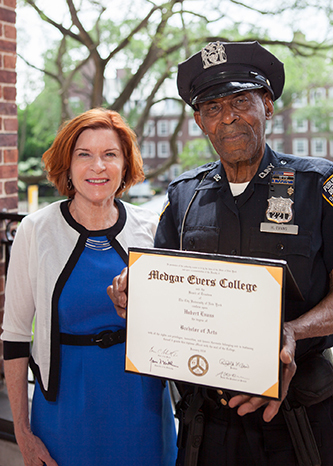 Brooklyn College Campus Safety Officer Hubert Evans didn’t waste much time obtaining his bachelor’s degree. After attending Medgar Evers College for just two years and 9 months, the 87-year-old achieved his long time dream and joined fellow graduates at the Barclays Center on May 24 for their commencement ceremony. Evans majored in political science and minored in physics. Born in Kingston, Jamaica, Evans moved to Brooklyn to join his family in 1980. After a career in the military, he joined the Brooklyn College staff full time in 1993. He raised seven children in the process, including a son who graduated from Brooklyn College. "I found that other officers were taking courses at the college because of the free tuition offered to us," Evans said. "It was an opportunity to achieve something I always wanted." His colleagues also supported his endeavor. "He’s been an inspiration to all of us," said Ursula Chase, deputy director of the Office of Campus and Community Safety Services. "We constantly encouraged him and supported him throughout as he completed his coursework. This is a man who walked to the college, from his home—quite a bit away—after a huge snowstorm, stopping once to call and say he’d be a little late; he doesn’t let anything get in the way of where he wants to go." Evans’ goal is to begin a career as a counselor, helping others to obtain a college education. In the meantime, he has a way of keeping himself busy. He smiled. "I’m looking at the fall course schedule to see what I want to take," said Evans.